Photograph courtesy Rex Conway collection. It appears that 5125 & 5121 are not long out of Derby Works, judging by the shiny paint and lack of exhaust stains on the roof. Tablet catchers have not yet been fitted and the curved roof panel for accessing the boiler filler is actually in place. In later years Glasgow would sheet this over, no doubt to ease maintenance and remove another spot on the locomotive prone to ice damage in winter. 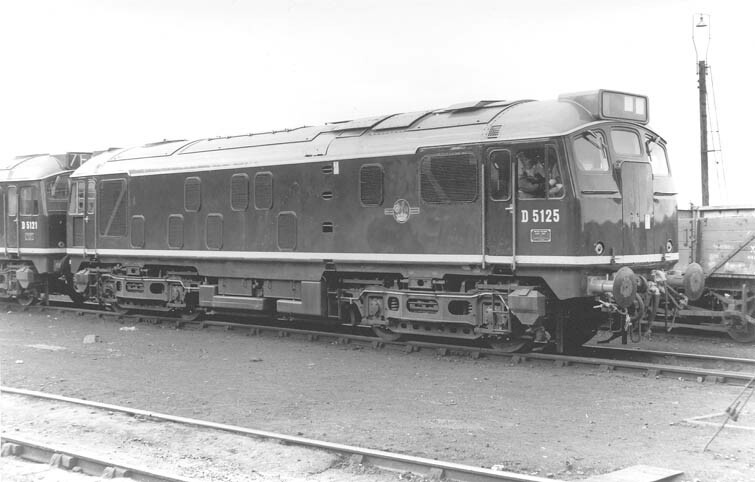 The fifteen year eight month career of D5125/24125 was spent allocated only to Scottish Region depots. November 1975 to store (unserviceable). After withdrawal 24125 was stored at Haymarket from November 1975 to January 1976, then stored at Millerhill (?) from January 1976 to May 1976. 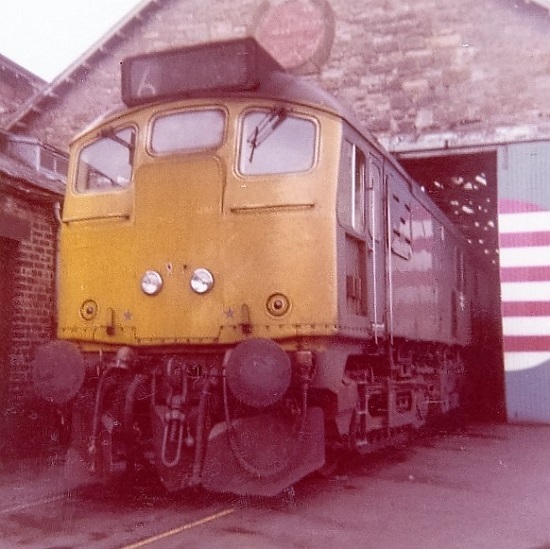 It was taken down to Doncaster depot during May 1976, remaining there until May 7th 1977 when it was moved to Doncaster Works with 24099 by 31181, and broken up by August 1977. Noted Glasgow Works May & June 1970. Noted Glasgow Works February 1973. Photograph courtesy Photograph courtesy Cumbrian Railways Association #KER118. D5125 stands at Barrow, presumably just after outshopping from Derby, and sent to Barrow for inspection by officials from Vickers Armstrong. This view shows the original position of the engine exhaust, just to the right of the boiler exhaust. This is probably the last time D5125 visited Barrow! Photograph courtesy Cumbrian Railways Association #KER118. Photograph collection of webmaster. Barrow was also the home of Vickers Armstrong, which played a major part in the construction of the Sulzer engines. 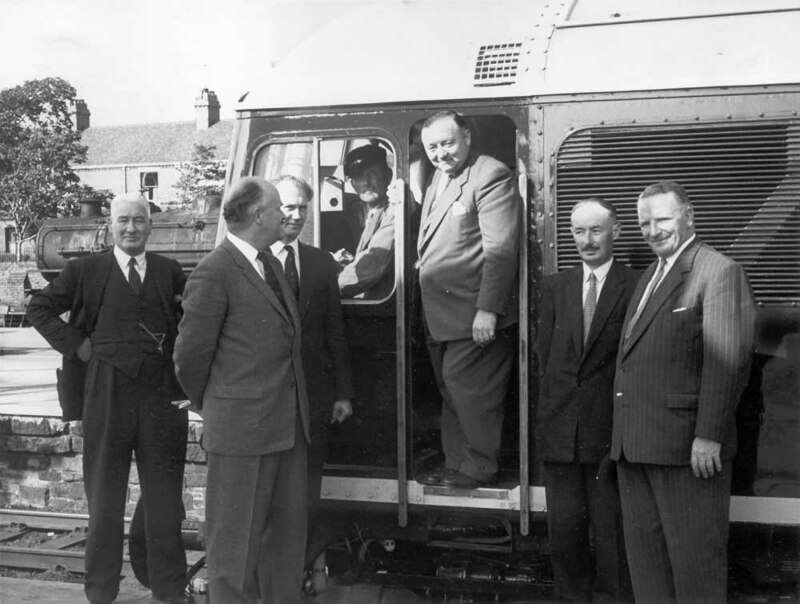 From time to time completed locomotives came to Barrow for inspection by a variety of senior people. Standing in the cab doorway is Mr. A Storey, Works General Manager whilst on the extreme right is Mr. R Keay, Engineering Works Manager. The locomotive is D5125, new from Derby Works during July 1960, which must provide a clue to the date of this photograph. Diagram changes to Morayshire coast services beginning in May brought Inverness based Class 24s to the Waverley route, possibly on layovers between trips from the Highland capital. One of the diagrams involved the 07.06 ex-Edinburgh, 13.00 ex-Carlisle, 17.54 ex-Edinburgh and the next days 09.20 ex-Carlisle. Most times a single machine sufficed, noted were D5125 (8th), D5122 (9th) & D5115 (10th & 11th). However D5128 & D5071 (64B) double headed on May 24th. Early November found major highway improvements being made to the A890 between the junction of the A896 at Strathcarron and Stromeferry. Just west of Strathcarron rail and road run alongside Loch Carron hemmed in by the loch and a cliff. It is believed the contractors improvements loosened the rock formation causing a landslide that severed the line trapping 5125 and a set of coaches on the Kyle side of the blockage. This equipment was used to operate temporary service west of the landslide. On January 5th 1970 in a delicate move over temporary track using a set of wagons the Type 2 was gingerly retrieved from its isolation, with its place being taken by another. To mitigate this landslide problem the line would remain closed whilst a concrete avalanche style shelter was constructed to provide protection for both railway & road. During construction of the shelter a temporary track was laid on the loch side of the shelter. Through services were restored on March 4th though construction expected to be completed by April 1970 actually ran over to July. Condition July: blue/yellow livery, gangway doors fitted with substantial weatherproofing, headlight fitted (? ), tablet catcher fitted, shortened water and fuel tanks, blanking plates fitted (five slats), hand/footholds present, cantrail water filler sheeted over, two-rung bogie mounted footsteps, ridge sided sandboxes, three-piece miniatue snowploughs fitted (yellow? ), BR emblems on each cab door, 'D' prefix still carried. Condition September: blue/yellow livery, gangway doors fitted with substantial weatherproofing, headlight fitted (? 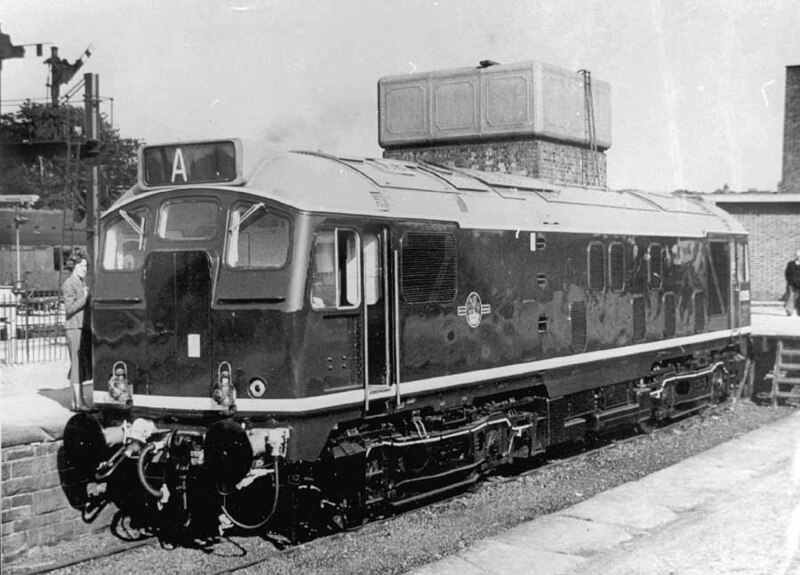 ), tablet catcher fitted, shortened water and fuel tanks, blanking plates fitted (five slats), hand/footholds present, cantrail water filler sheeted over, three-rung bogie mounted footsteps, ridge sided sandboxes, three-piece miniatue snowploughs fitted (black), BR emblems on each cab door, 'D' prefix still carried. 1955 19.43 Inverness - Chester - Crewe. 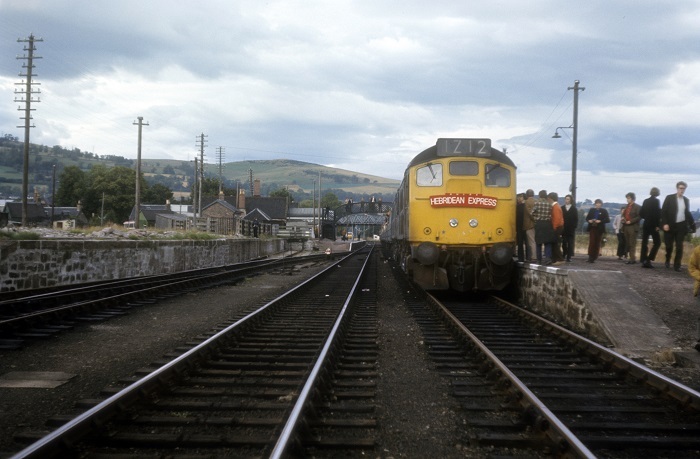 Photograph courtesy Bernard Mills Class 24 Nos.5125 & 5129 at Dingwall on September 18th 1971 (uncertain which loco is leading here, maybe 5129). Locomotives outshopped from Glasgow Works and requiring road testing frequently used the 10.10 Glasgow Queen Street – Dundee and 12.50 return. So noted on June 9th was Inverness based 5125. Photograph courtesy Nick Ross Class 24 No.5125 at Inverness depot on July 30th 1972. September 14th proved to be a challenge for the operating authorities north and south of Inverness. A Euston - Wick charter stopped north of Slochd with two seized traction motors on 26034, which had ironically replaced a failed 26043 at Perth. Inverness sent out 24129 & 26033 to remove the defective Class 26 into the siding at Tomatin, returning to the train (with 26035 still attached) to assist on the short hop to Inverness. This one hundred and fifty minute stand on the mainline well and truly bottled up traffic with seven trains stuck. Once clear of Inverness time was made up with only a two hour late arrival at Wick! Another special in the area, Grand Tour No 20 from Edinburgh to Kyle of Lochalsh with 40081 became embroiled in the delays, having reached Inverness where 24116 & 26035 substituted, was then subjected to a slow ride to Kyle, caught behind a heavily delayed stopping service hauled by 24130. The Grand Tour was turned quickly at Kyle, but at the expense of the most heavily delayed train of the day, a charter from Leicester to Kyle. This had been three and a half hours late at Inverness, and would leave Kyle ninety minutes late behind 24125 & 26042, much planning having to take place to allow all the extras to cross the service trains as expeditiously as possible. The Grand Tour would arrive back in Edinburgh almost three hours late. 24125 at Carstairs April 4th 1976 (missing a buffer), looks out of use for a while - bird poop spattered roof, (stabled with 24099). 24125 at Doncaster depot with 24126 on October 31st 1976. 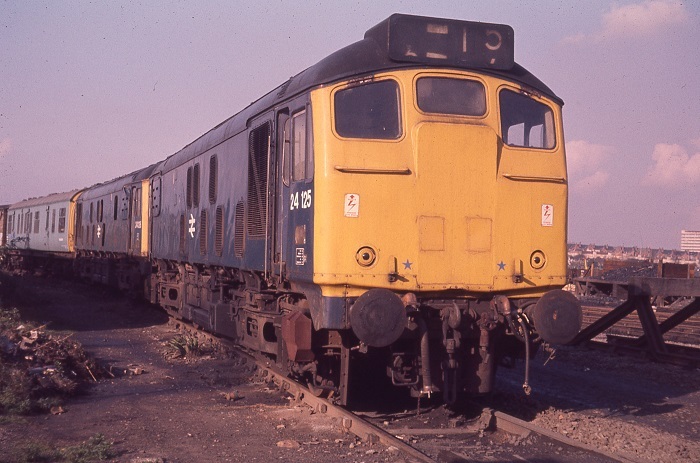 Condition final: blue/yellow livery, gangway doors sheeted over, headlight location replaced with square plates, shortened water and fuel tanks - both equipped with circular gauges, blanking plates fitted (five slats), hand/footholds plated over, cantrail water filler sheeted over, three-rung bogie mounted footstep on No.2 bogie - two-rung bogie mounted footstep on No.1 bogie, ridge sided sandboxes, three-piece miniatue snowploughs fitted (yellow). Class 24s 24125 & 24126 at the back of Doncaster depot on October 31st 1976. Page added August 17th 2016.